Evidently, they broadcast these shows live on www.folk-book.com, based on the line at the bottom of the ad. 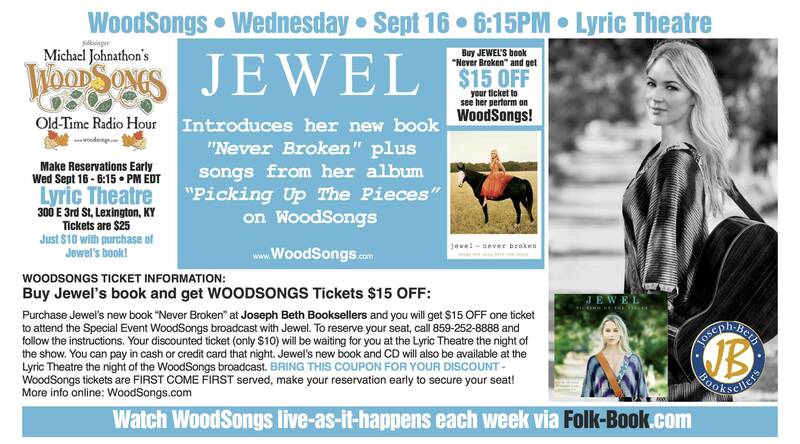 However, in looking at the main site, every ad for every show but this one also says, "For a one time only subscription of $5.95 you can watch ALL WoodSongs live events each week FREE." 2) I'd assume this applies to the Jewel show, too. Worth it? I'd say so. 3) Do you have to register at Woodsongs? Or Folk-Book? Who the hell gets your money and how do you give it to 'em? That's 'cause we have this one. That other one would have been fine if I'd seen it. :-[ See, what had happened was...it was hiding behind Couch. Yeah, that's my story. It is buried between that and a giant hitler smiley, so... it's all good.